Walk through the gates, across the courtyards and enter the magical experience that is the spectacular and prestigious Palace of Versailles. Host your events in Versailles and enjoy the beauty and majesty of the place, while contributing to its preservation and upkeep. Follow in the footsteps of France and the world’s most famous hosts for an entire evening and give your event its place in History. 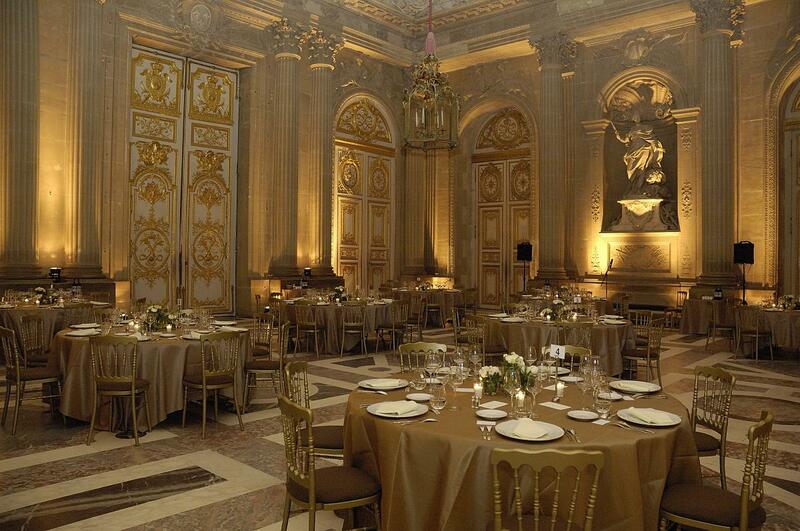 The Palace of Versailles makes the museum’s and estate’s spaces available for use by companies, institutions and associations for organising prestigious evening events such as gala dinners, cocktail receptions, concerts, balls, exclusive tours, fountain displays and fireworks. 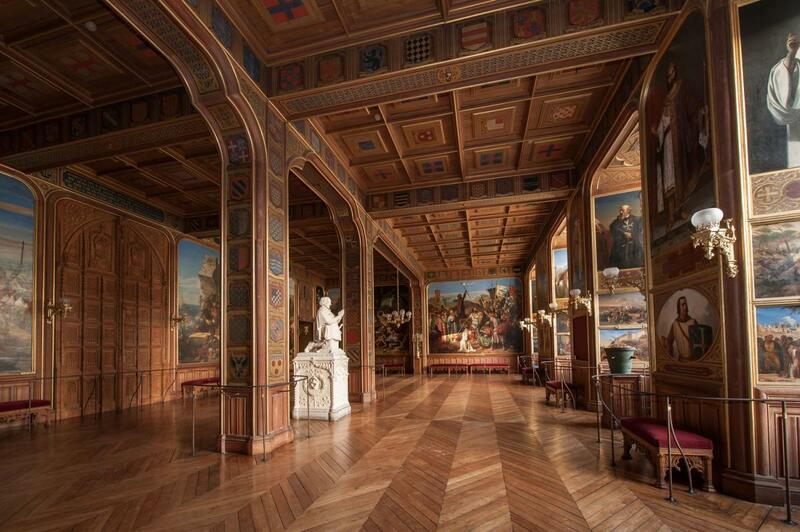 Covering the length of the South Wing’s first floor, this sumptuous gallery was created by King Louis-Philippe in 1837. The 35 paintings covering its walls, which include The Battle of Taillebourg Won by Saint Louis by Eugène Delacroix, The Entry of Henry IV into Paris by François Gérard and The Battle of Fontenoy by Horace Vernet, recount the most significant episodes in France’s military history from Tolbiac (496) to Wagram (1809). This room is available for organising dinners and cocktail receptions for 600 to 800 people. Length: 120 m, width: 13 m.
Accessible via the ground floor gallery in the North Wing, these five rooms with their neo-Gothic decoration depict the key events of the Crusades through 19th-century official paintings. Coats of arms of the most illustrious crusaders adorn the ceiling coffers and pillars. 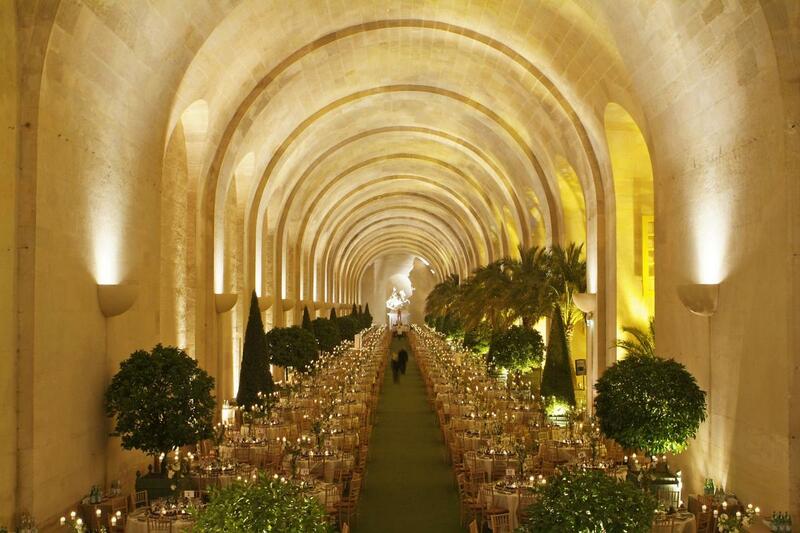 The largest room (250m²) can host dinners for 180-200 people and cocktail receptions for 300-400 people. Built between 1684 and 1686 by Jules Hardouin-Mansart to house precious trees and shrubs in winter, this extraordinarily large building lies below the South Parterre, for which it provides structural support. Two monumental staircases called the “Hundred Steps” flank the three galleries of the Orangery which overlook the parterre containing more than 1,200 exotic trees during the summer months. The Orangery is available for use for your events from 20 May to 20 October (dinners, cocktail receptions, dance evenings, performances, fashion shows). Capacity: 1,200 people seated or 2,500 standing. The central gallery is 156 m long, 12 m wide and 13.24 m high, and the side galleries are 70 m in length. On the first floor of the North Wing of the Palace, the Hercules Room is the entranceway to the King’s State Apartments. As well as its precious decoration of coloured marble with Corinthian pilasters, visitors can admire The Meal in the House of Simon by Véronèse, which has been here since it was presented to Louis XIV by the Republic of Venice, in 1729. The King walked through this room every day to get to the Chapel, it also hosted royal great royal celebrations. Your cocktail receptions will be added to the list of events held in this room, including the famous 1739 formal ball. The ceiling depicts the Apotheosis of Hercules, painted by François Lemoyne, and which saw him named the First Painter to the King. This room is located on the first floor of the North Wing of the Palace, above the Chapel Vestibule, opening directly onto the royal tribune. Its architecture is identical to that of the Royal Chapel. This marble-floored room features Corinthian columns, and is spectacularly framed by Jacques Bousseau’s Magnanimité and Gloire tenant le portrait de Louis XV, by François Antoine Vassé. The large double doors, with their finely carved lock by Desjardins, open onto the Chapel, with a view of the organ. Already part of the original Palace offering, this understated, refined gallery is located just below the Hall of Mirrors, between the Marble Courtyard and the gardens. It is preceded by a vestibule decorated with columns and pilasters, with alcoves containing the works of Louis XIV’s “Grande Commande” commission, a series of 24 statues designed by Le Brun, which depict the universal themes of the four parts of the world, the four seasons, the four parts of the day, the four humours of man, the four forms of poetry, and the four elements. 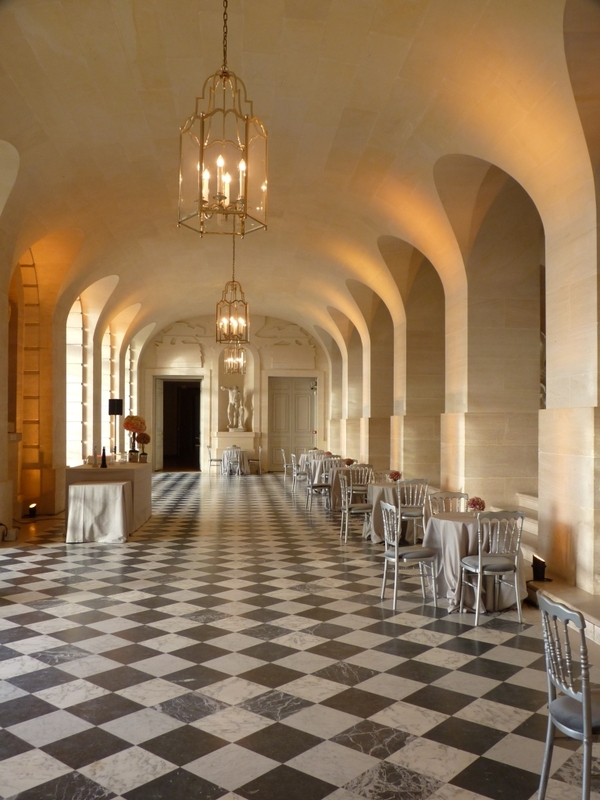 The space is perfect for intimate gatherings, and when the weather permits, the room opens onto a broad view of the gardens of Versailles, listed on the UNESCO World Heritage List. This refined, light gallery opens onto the gardens on both sides and is decorated with paintings by Jean Cotelle (1642-1708), depicting the park and groves of Versailles during the reign of Louis XIV. It is located in the North Wing of the Grand Trianon, the marble palace commissioned by the King in 1687 and built in the heart of a sumptuous garden by his architect Jules Hardouin-Mansart. 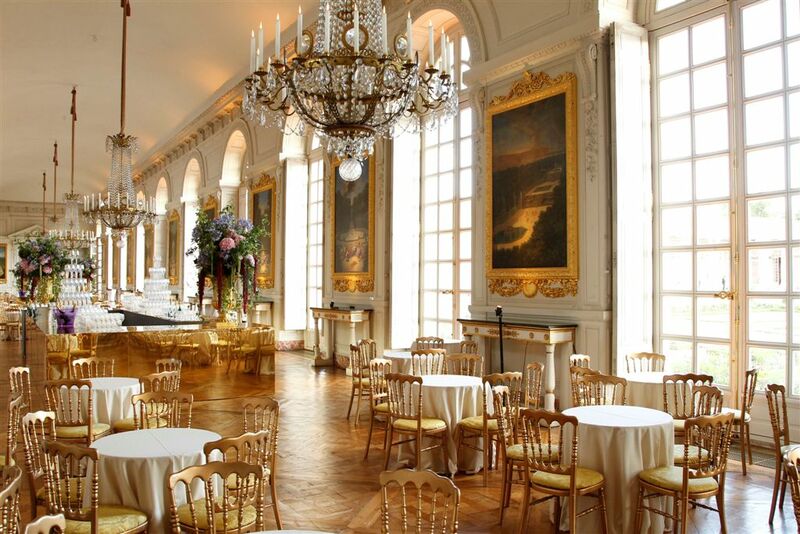 The Grand Trianon gallery can host 250 people for a seated dinner or 400 people for a cocktail reception. 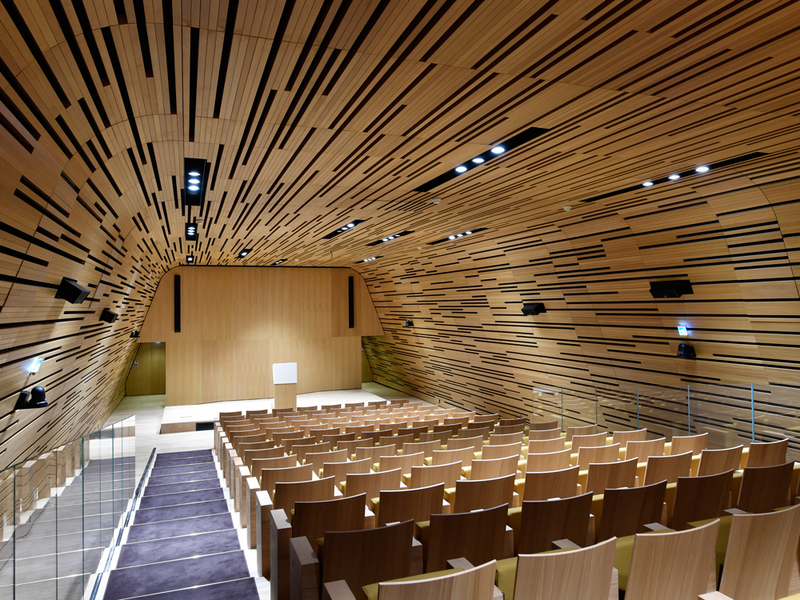 It has excellent acoustics for chamber music concerts. 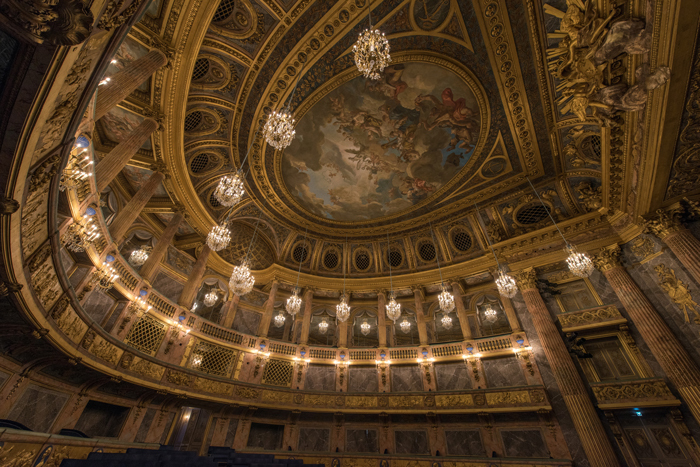 A masterpiece by Ange-Jacques Gabriel and Blaise-Henri Arnoult, First Architect and First Theatre Technician to Louis XV respectively, the Royal Opera House was unveiled on 16 May 1770 to celebrate the marriage of the Dauphin, later King Louis XVI, to the Archduchess of Austria Marie-Antoinette. The large size of the stage, quality of the acoustics, perfection in the proportions and refinement of the decoration by painter Durameau and sculptor Pajou make it one of the most beautiful theatres in the world. The Royal Opera House can host up to 600 people during the evening for musical, dance, theatre or opera performances (stage: 12.30 m opening, 23 m deep, 36 m high). Halls/rooms adjoining the space are also available for organising breaks, meals or receptions. The two spaces boast unique views over the Royal Courtyard and the Main Courtyard. 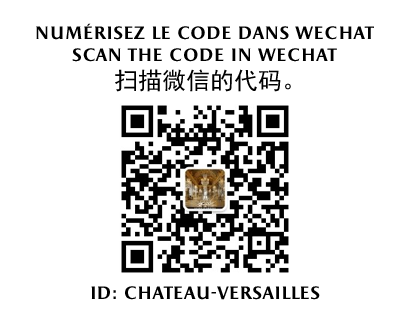 The Palace of Versailles may be opened especially for you, for a 1 ½-hour guided tour. 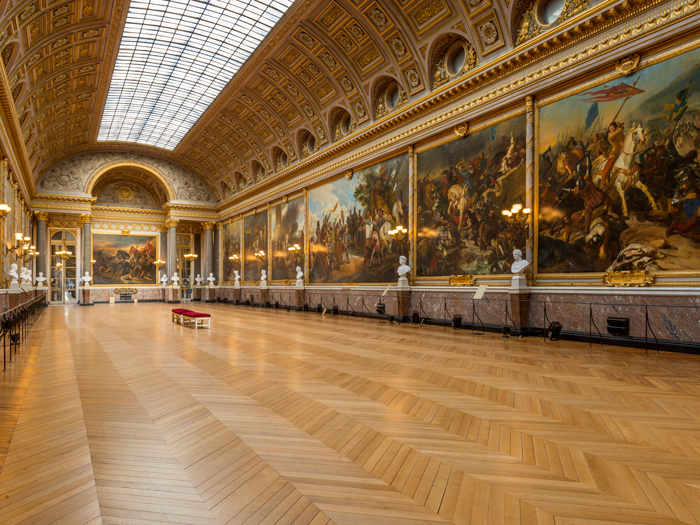 Visit the King’s State Apartments and the Hall of Mirrors outside public opening hours and discover a new Versailles.